Did you know this Friday (27 July) is Planet Ark’s Schools Tree Day, and Sunday (29 July) is National Tree Day? I probably don’t need to tell readers of this blog about the importance of trees in our environment (and that includes where we live, not just “out in the bush”! ), so I’ll keep it short and point you towards some resources to find out what’s happening near you on Tree Day. Stick your postcode in and it’ll show you the events planned in your area. There looks to be a number of things in the Wollongong/Shellharbour/Southern Highlands area. Why have I got a picture of Lee Kernaghan? He’s one of the National Tree Day ambassadors for 2012! Earlier this year, Planet Ark developed a report on the benefits of interaction with nature for children’s health, wellbeing and development. You can access the full report here: Planting Trees: Just What the Doctor Ordered (2.7 MB PDF). I fully expected the report to say that spending time in nature helps children’s mental health, development, gross motor skills, etc. But I was surprised to learn that children who spend time outdoors have lower incidence of myopia (short sightedness) and have lower average BMI (body mass index) compared to children who spend most of their time indoors. There are real, measurable, health benefits to getting the kids outside. 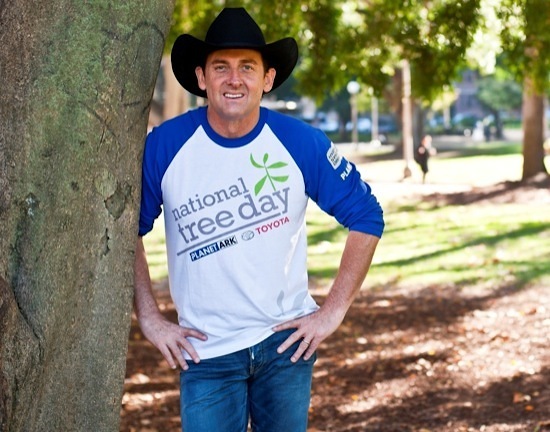 Toyota has been a sponsor of National Tree Day for more than a decade now, and to help promote it this year they’ve given me a $100 Bunnings voucher to give away to a lucky reader. That’d buy you a few nice trees. Thanks Toyota! To be in the running for the voucher, leave a comment below telling everyone what your favourite Australian native tree is. I’ll pick the winner randomly (one entry per person) at midday on Sunday (AEST). Apologies to overseas readers, but this contest is for people in Australia only. The voucher wouldn’t be much use to others anyway! Feel free to leave a comment still, but just let me know if you’re not in Australia. Oh, and my favourite native tree? I’d have to say Macadamia, although I do like Illawarra Flame Trees and red flowering gums as well. Oh, and of course wattle! National Tree Day 2011 – Giveaway! National Tree Day 2012 Voucher Winner! $50 Bunnings Gift Card Winner! Lemon Myrtle. Attractive AND edible. Can’t go past that! Decreased incidence of myopia (short sightedness). This is indeed true! As we focus at different distances the lens in our eye changes shape so that we can focus on things a different distance away. Kids who stay inside, particularly those focussing solely on close screens like computers & hand held tech toys are never asking their eyes to focus on a ball 100m away or trees at the end of the oval. Just getting outside for a walk & focussing on the horizon everyday for half an hour is enormously helpful. It’s not even the exercise it’s just being in an environment where the furthest thing you can see is not the wall of the room you are in. Sadly my 18 year old son is very short sighted and the above has been given to us as a probable cause. There are reasons for his lifestyle but I wish I had pushed this harder when he was younger. Learn from my experience. Forgot to write about my fav tree! Probably the Karri. We planted 80 of these majestic trees 3 years ago on our block as we border national park in south west WA. Just love their mottled pale green trunks. Spotted gum is gorgeous too. How to pick one? It could be the Macadamia for its delicious nuts or the Blue Quandong or Lilly Pillies for their berries or the native Hibiscus for its lovely flowers or the native Frangipani for its delightful fragrance. I’ll stick with my old favourite the Macadamia. I like the plum pine (Podocarpus Elatus). It is a beautiful tree, especially when the bright green new growth shoots. And the purple fleshy base on the seeds is edible. I have grown several trees from seed collected in the Illawarra rainforest. My favourite native tree (I hope its native), Liquid Amber. When I was growing up we had one in the front yard. It was a great tree to climb and to hang out under. I’ve always been partial to the “Melia Azedarach”, otherwise known as the “White Cedar”. I like Golden Grevillea and Gompholobium scabrum Painted Lady. My favorite native would have to be Davidson Plum, but pretty much any native that is edible 🙂 Happy National Tree Day!! I love the silver princess, gorgeous, and not too big! My favourite native is the Lilly Pilly, otherwise known as the bush cherry! I love the Golden Wattle, especially when it is in full flower. So beautiful to look at! I have a yard full of Grevilleas which are great for attracting the birds. I think the best one is Honey Gem, and we can often sit in our dining room and watch the lotikeets drinking its sweet nectar! I like the Eucalyptus tree. It’s iconic back in Sweden where I come from originally. And the scent is so fresh.